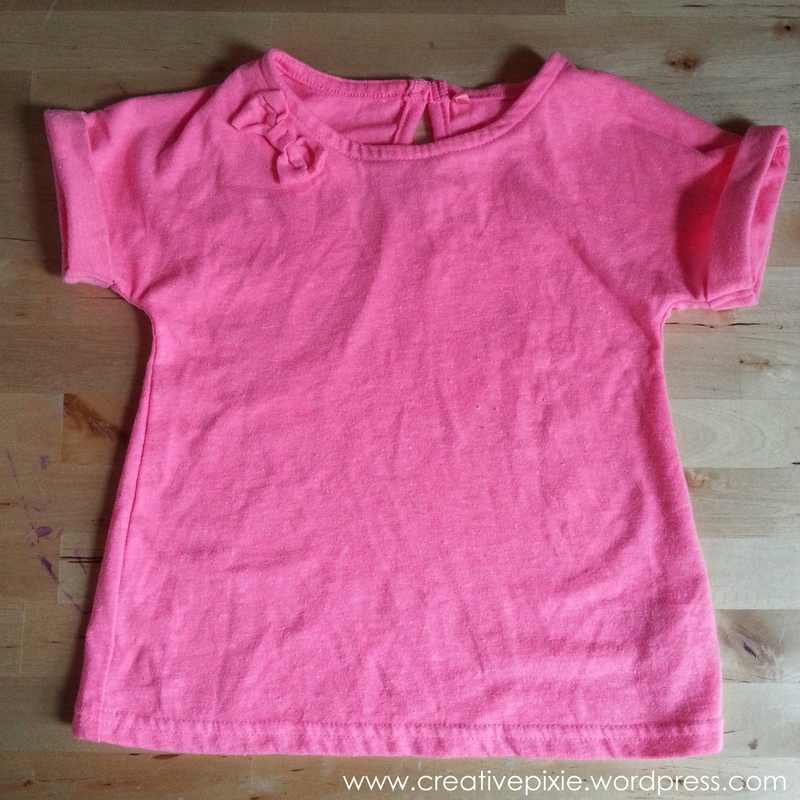 This weeks make is something that should appeal to any parent of a young child – an upcycled T-shirt. Miss E had this T-shirt when she was 1 (she turned 3 last week) and although I’ve given most of her small clothes to my niece I couldn’t really give this to her as it has a stain on it. I couldn’t bear to throw it out so the T-shirt stayed in a drawer until I recently had the idea to do something with it. I especially like the applique butterfly on it, embellished with buttons. 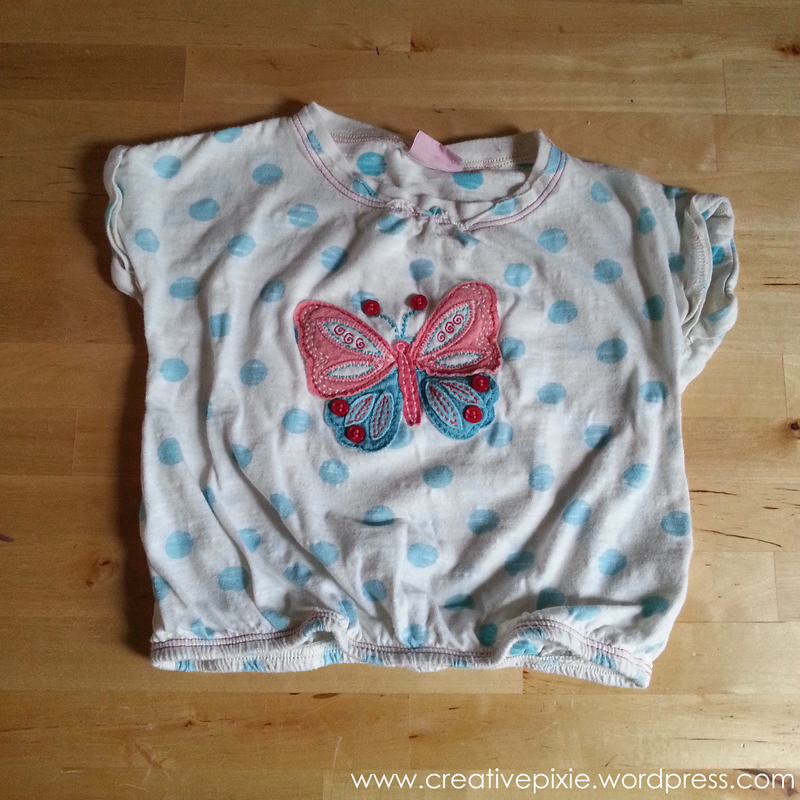 I decided to cut out the butterfly and sew it onto another T-shirt – thus getting rid of the stained t-shirt whilst keeping the cute butterfly. 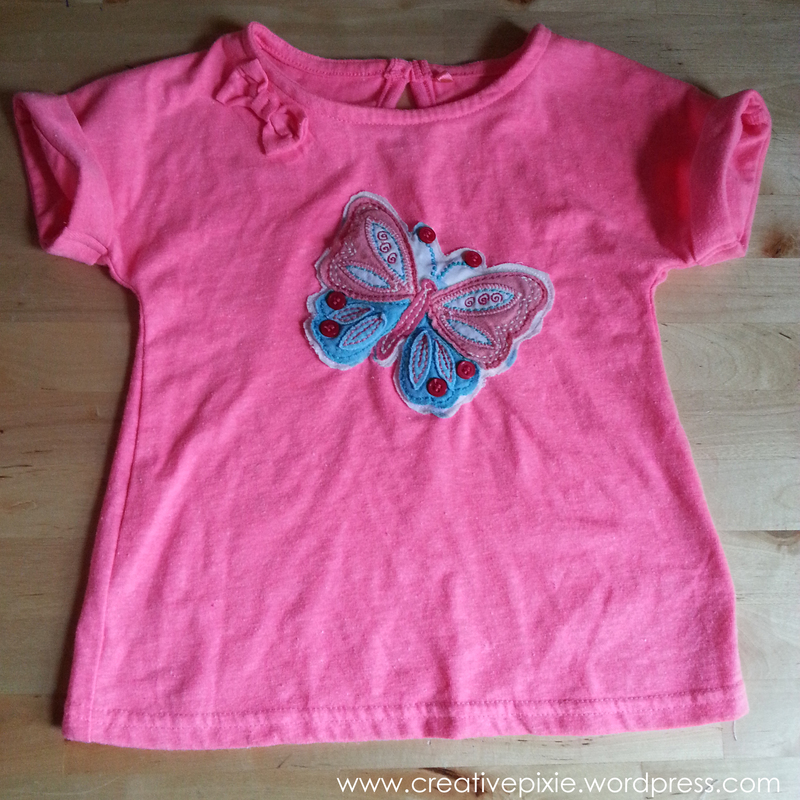 This T-shirt was lying at the bottom of her drawer and would be perfect for the butterfly to be added to. 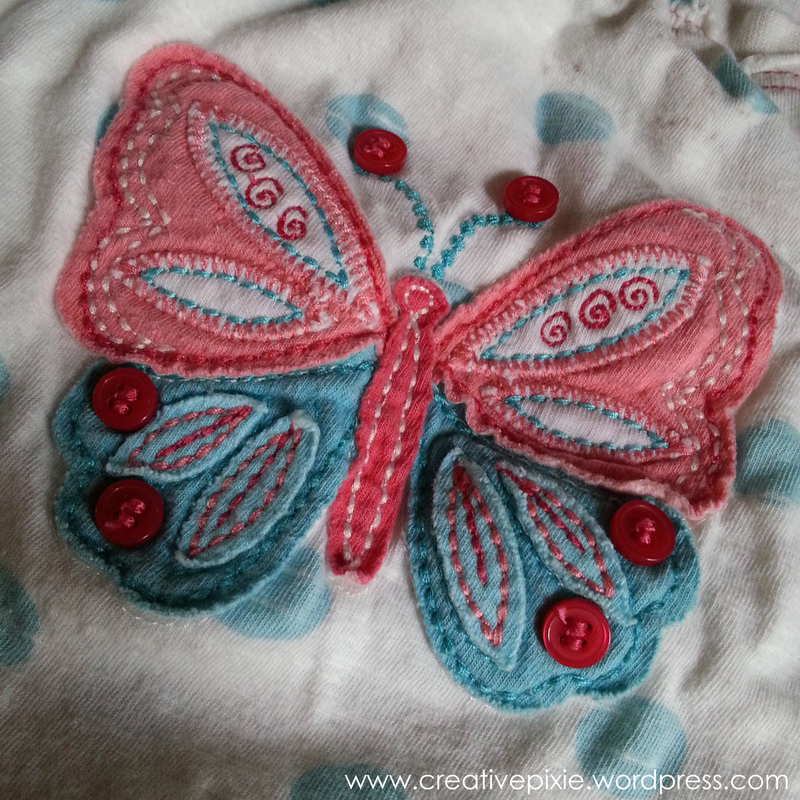 So out came the sewing machine (which is in bad need of a service – grr) and I carefully sewed around the butterfly. 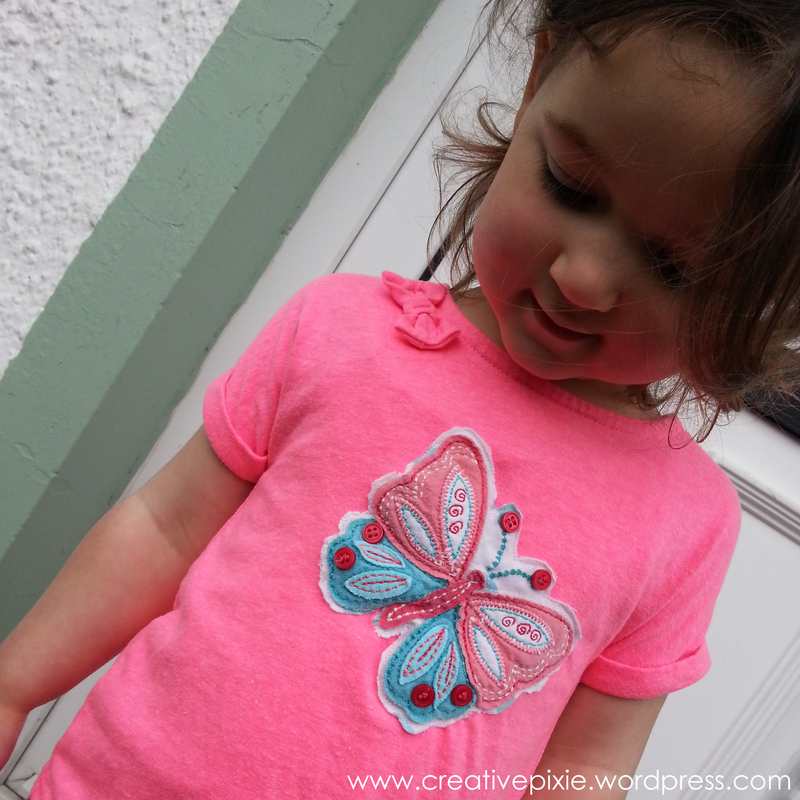 Miss E was so excited by me making her a ‘new’ T-shirt – not bad for a quick make to jazz up a plain T-shirt and making use of something that would’ve probably gone to land fill. Thank you, she is but then I’m biased 🙂 It’s funny as it’s the 1st time I’ve got her to pose for a blog post photo and she’s obviously been watching when I’ve taken photos of Miss P for previous posts. Perfect way to enjoy something you loved in a new way. T shirts are so much fun because we can make them special so easily. Great idea. It’s always a little sad when they grow out of a favourite item. Great idea. I’m hoarding old t-shirts now to make home made yarn. Have you tried that? Such a simple idea, but what a lift it gives to the plain pink T-shirt. Brilliant.